Directory – West Cumbria Coast – Where to Go and What to Do. 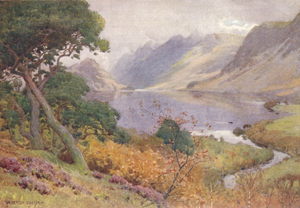 To me Crummock Water is one of the most beautiful of the English Lakes, but that may be due to its special significance in my life. Back in the 1970s when I was still in manufacturing industry I’d been seriously overworking and needed a complete mental break from everything. My wife generously allowed me to leave her and the children at home while I went for a week to a cottage owned by some friends in a small village north of Bassenthwaite Lake. It was a beautiful week of warm sun. One afternoon I climbed a little way (just a little way) up a slope by Hause Point and sat reading and praying in the sunshine. But what of the lake itself? 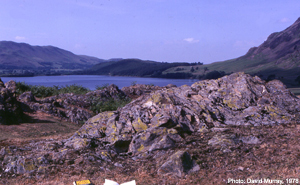 Crummock Water is not quite three miles long and just over half a mile wide at the slightly broader northern end. It is quite deep, at over 140 feet. As the lake heads into the hills Hause Point juts out prominently from the eastern shore, creating two separate areas of the lake. The northern area is much more open to the sky. The southern end goes deeper into the mountains as it approaches the hidden Buttermere. This is the land of Nicholas Size’s book, The Secret Valley, telling of the success of the long-settled Norsemen in fighting off the eleventh century Norman invaders. Whether it’s factual history or substantially local legend I’ll leave others to judge, but I’ve loved the story ever since buying a copy in Keswick more than forty years ago. Close to the south west of the lake is the highest waterfall in the Lake District, Scale Force (125ft.) which is most easily reached by a two mile walk from Buttermere. On the western shore the screes of Mellbreak come down to the water’s edge in a manner reminiscent of Wastwater, but here everything feels much more open, less oppressively threatening. At the northern end the River Cocker leaves the lake, eventually to flow into the Derwent at Cockermouth. There are salmon and sea trout to be caught in the Cocker and fishing is good in the lake itself, subject to a permit from the National Trust, which owns most of this area.